We are well into November! Can you believe it. How time just passes us by. The end of October is a real benchmark in the passage of the school year. It marks the traditional end of those warm fall days with the passing of Halloween and also ushers us into a new period of learning. The first six weeks or so of school belong to learning routines, building friendships, and becoming confident learners. Around Halloween I just see this explosion of independence and self directed learning that will propel us through the dark and chilly months ahead. This fall has been no different. In the last few weeks I have witnessed every child become more independent in their learning and strengthening skills by leaps and bounds! Mrs. Sharp, a former Kindergarten teacher, comes and reads with the children each week. She noted to me on the way out last week what an amazing job the children were doing. Things that might have been difficult for some the week before seemed to be a breeze last week. While we work hard at school, the reading and exposure to language that our children get at home makes a tremendous difference too! So back to math and science! You may have noticed the spider - counting by tens work coming home a lot lately! Well it wasn't just a dot to dot exercise! The children had to spread out the hundreds chain, mark each increment of 10 with a spider marker and then record their work on the dot to dot. This activity gives the children a concrete representation of what 100 is. It clearly shows them the increments of 10 and how it takes 10 of these increments to make 100. These two pictures show a child working on the base ten system. You may have noticed notes about the base ten system on your child's work ticket last week. Most of the children wanted to give it a go. We start our learning about base ten by using ones, tens, hundreds, and thousands beads and blocks. These cards direct the children to build certain numbers by collecting the proper number of ones, tens, and hundreds. Once the number has been assembled they go back and look at the total number that was made, as well as its parts. I love these cards because they draw the children's attention to the parts of the number and then show them how those parts correlate to the whole. For example 1 hundred, 4 tens and 2 ones is written 142! There are many "Ahh ha" moments with this work! We have been studying the bat of late. The only flying mammal! While studying the bat we have also been discussing characteristics of mammals. Ask your child if they can tell you what makes a mammal. 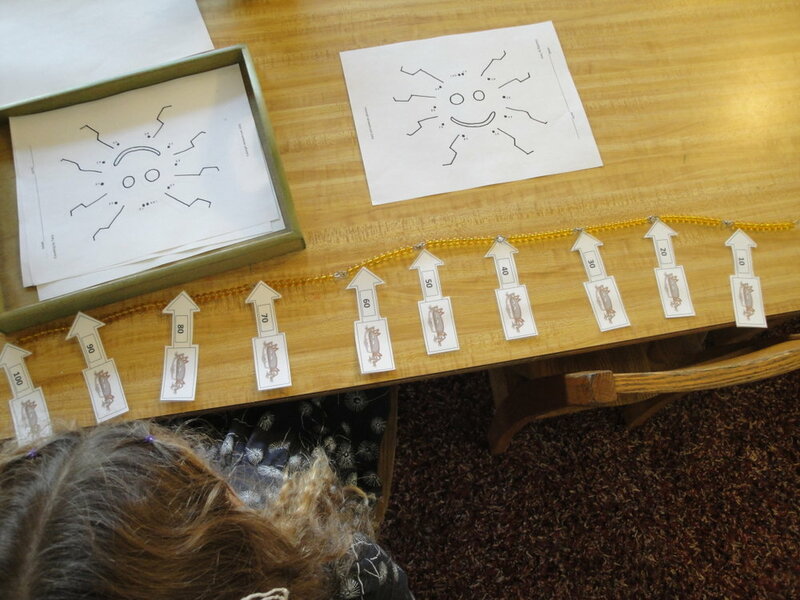 When tracing and labeling diagrams, children are working on fine motor control as well as learning letter formation and for those not yet reading are learning beginning sounds. The readers amongst us are adding additional words to their vocabularies and finding new patterns in words. Young children love maps and learning about the world as well as their place in it! Along with the bat study we have been talking about mapping and especially North America. Previously, we have discussed the world and the continents, but right now we are focussing on our continent. The children can make maps, color maps, do map puzzles and animal sorts of North American animals. Map making, like the animal tracing work, creates concentration, strengthens those fine motor skills and give an opportunity to children to practice language skills. November promises to be a very busy month. We have a long weekend coming up followed by Thanksgiving! As November passes us by, lets take time to count our blessings. I think daily about how blessed I am to work with such wonderful families and teachers. The addition of Mrs. Broome to our school has been one of my largest blessings this year! Thank you all and I appreciate you every day! A Show, A Vote, & A Birthday!